…but now my yard has 2″ of snow over it so all hints of green are currently hidden. 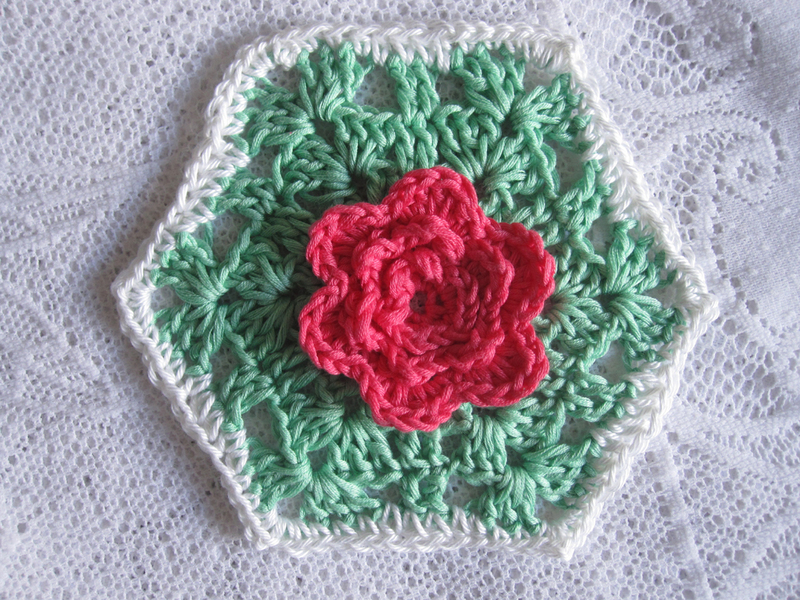 Lucky for me, I found myself able to sit down last night and make something springy and colorful without a single interruption. No, really. This is monumental. Even the dog remained at my feet without so much as a whine. I may have to wait for my spring garden, but at least there’s this! And yes, it’s in the shop for now. Well, almost. 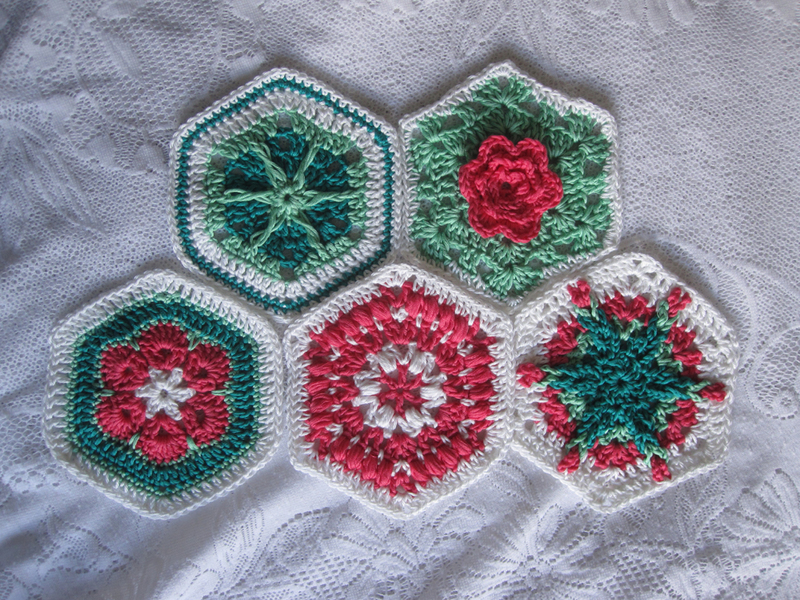 I still need to block them (on tonight’s agenda), otherwise my little hexagons are ready for their trip across the pond to Patch and her collaborative blanket project! And the last two I made up completely after trying a couple patterns and scrapping multiple times. A frustrating process, but I like the end results muchly. 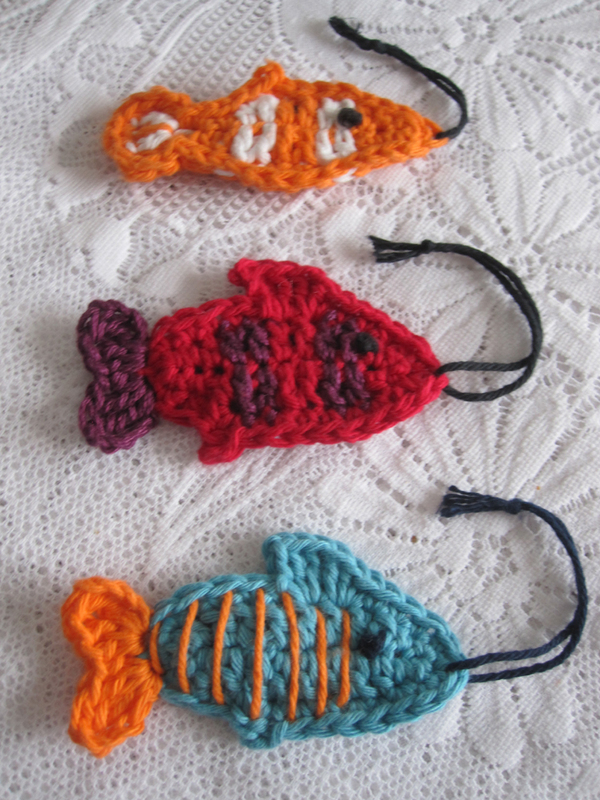 Apparently I have a thing for 3D crochet? I love textures. I have been thinking, albeit reluctantly, that it may be time to close down the Etsy shop for good. I have kept it open off and on for 7 years, but now it comes down to a few simple facts. I do not have the time to pursue networking, marketing, or otherwise Do Stuff on the site to encourage traffic. I make regular but small sales, which is lovely, but it’s not even breaking even for me, and if I can’t invest the time to change that, I can’t justify maintaining the shop. The Dearliest suggested I look into local shops to see if I can sell some things in town. I have to admit…removing sales and shipping fees sounds kind of attractive. I don’t even know where to start, though. Maybe it’s time I asked around. I love making things. I will keep making things, even if it’s just to give to the people around me. 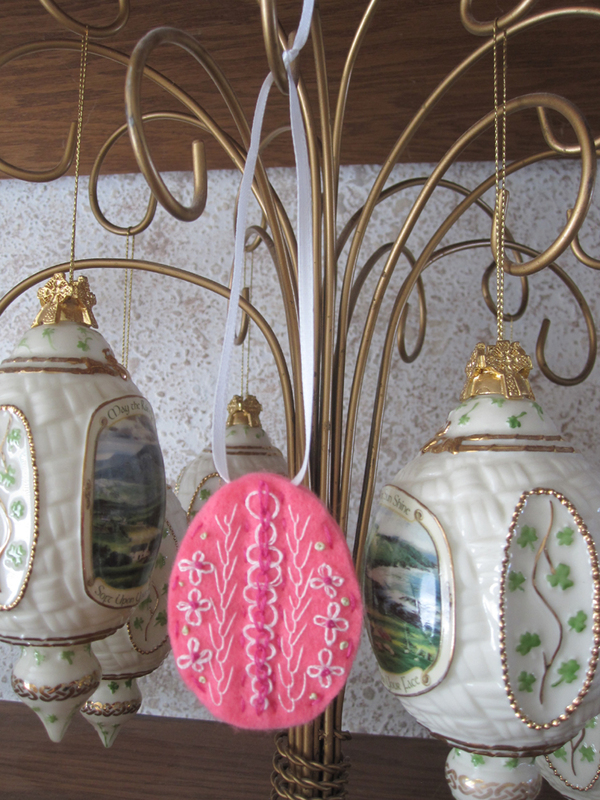 The pink sampler Easter egg is done! 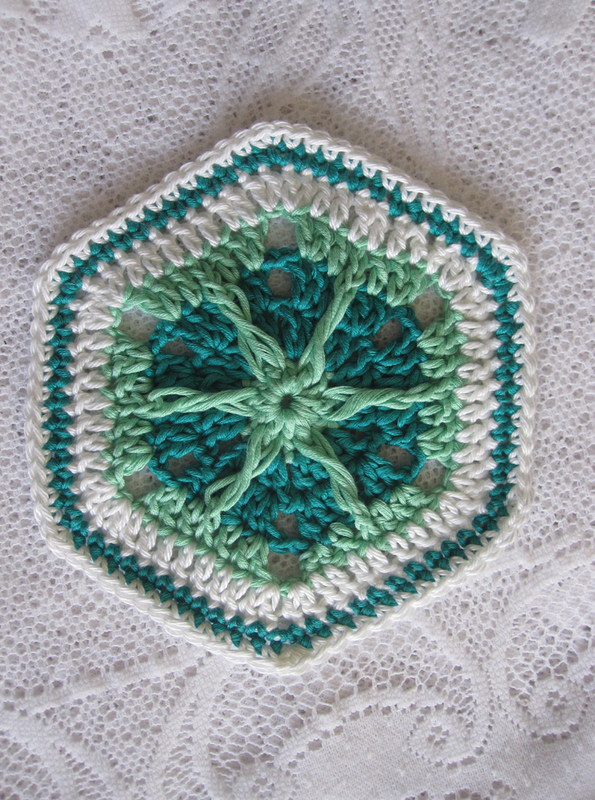 Now, the difficult decision…start another egg or finish hexagon #3? 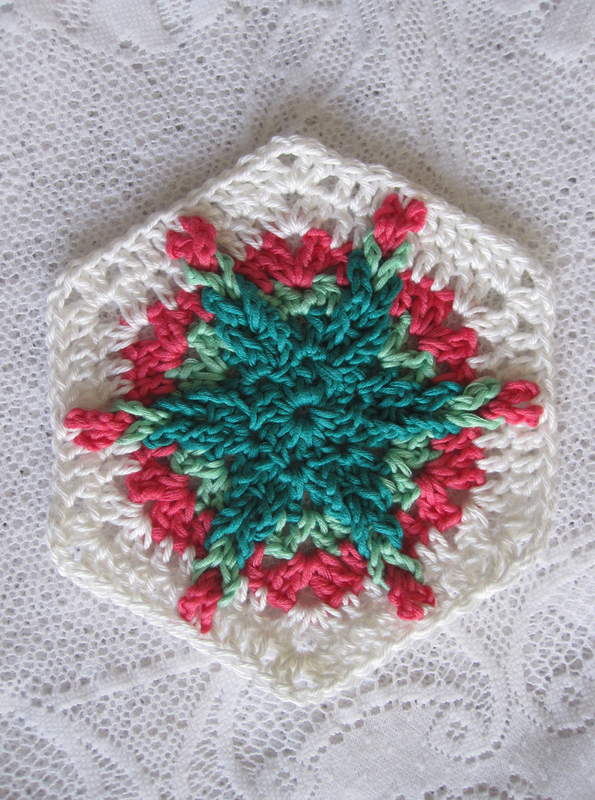 Probably an egg, since I can crochet in the evenings. Can’t see the needle well enough to stitch once the sun goes down. And sun! Do we ever have sun! It has been wonderful, wonderful, to see the bursts of sunshine between the rainstorms. I discovered daffodils the other day. We’re still about 2 weeks away from bloom time, but they’re up and growing! …but now I can only think of one of them so I guess I’ll start with a projects post! 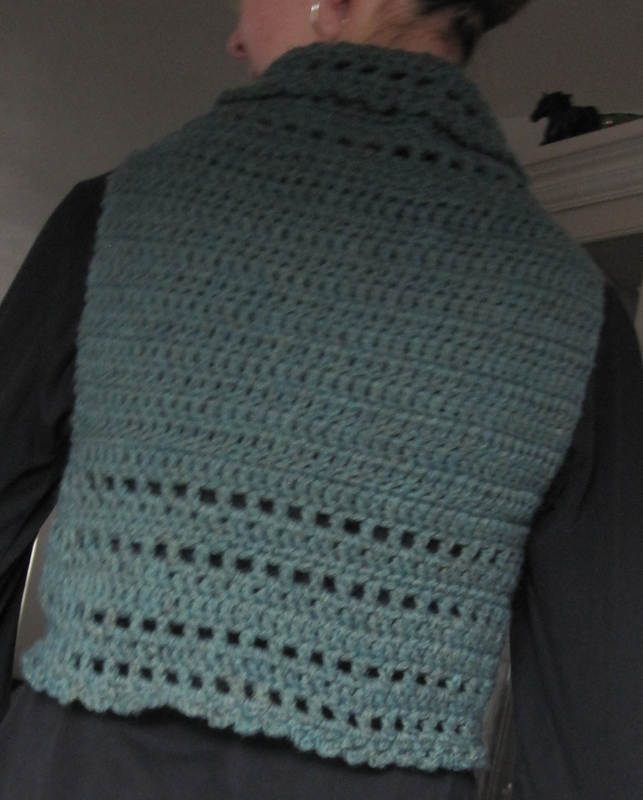 After I finished the vest I had, believe it or not, nothing else going on in the handwork department. I can count on one hand the number of times this has happened, mostly because I find the feeling so uncomfortable I try to avoid it as much as possible. …and then the last of my yarn for the CC project showed up so I was able to start that! The block isn’t big enough yet, but I have a Plan. This cotton is lovely on the fingers, but it took me almost the whole block to get used to it. I’ve been working with wool blends all winter and got locked into that, apparently! 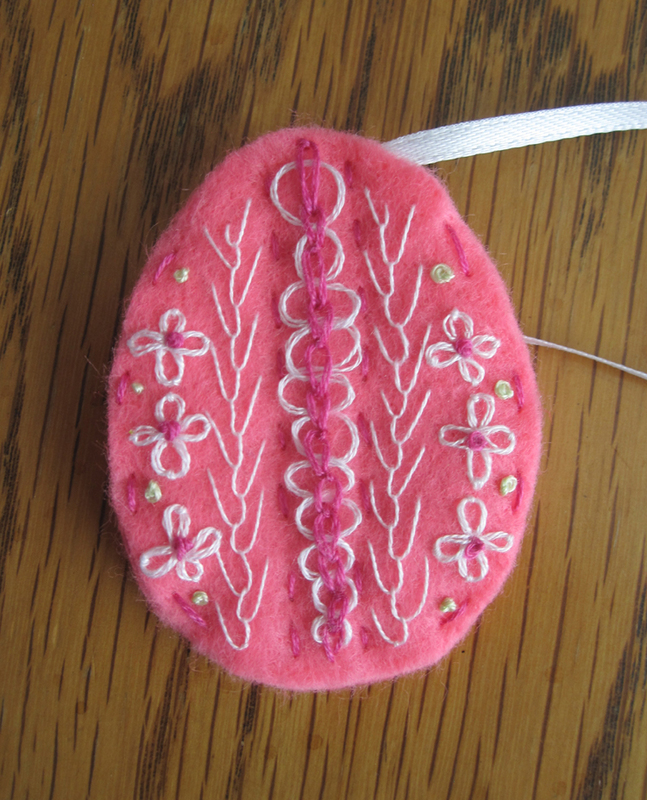 At the same time I started working on a new felt embroidery project for Easter, taking inspiration from a Russian style of egg art, specifically Kraslice and Pysanky. 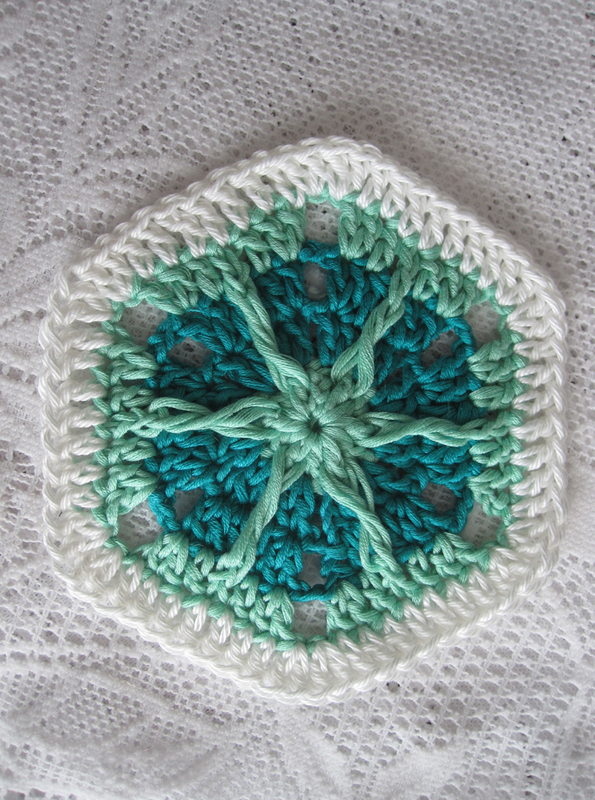 The first go around is more of a stitch sampler, but it’s a start. 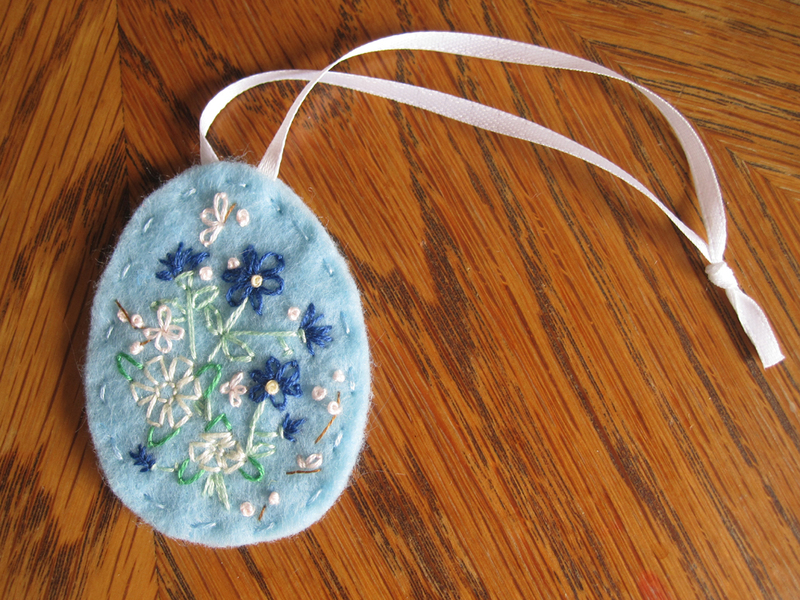 I have ideas for others and am rather happy I can plow through all my pastel and bright spring felt colors. 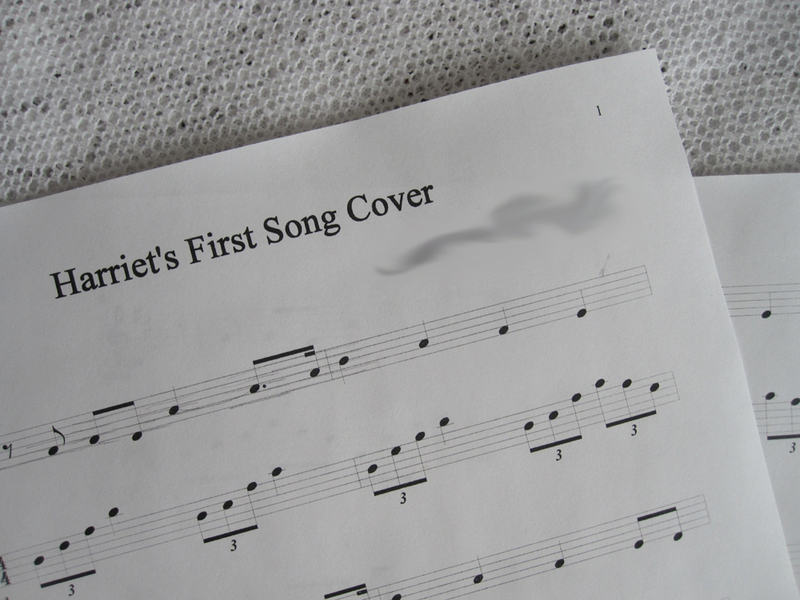 Remember when I offered a sneak peek of a new project here? Well, it’s done! Only it’s not at all what it started out to be. I got half way through with my first idea and realized I was going to run out of yarn so I scrapped 2 weeks of work to start something new. I didn’t mean to copy this lovely vest and I suppose technically mine is a little different. Sometimes I find it hard to know where the line is between copying and inspiration. I looked at the picture once and thought oh, that’s pretty easy! I could do that! Then I sat down, took measurements, and got to work. It was only when I went back and looked at the picture again after I was all done that I realized just how similar it was. 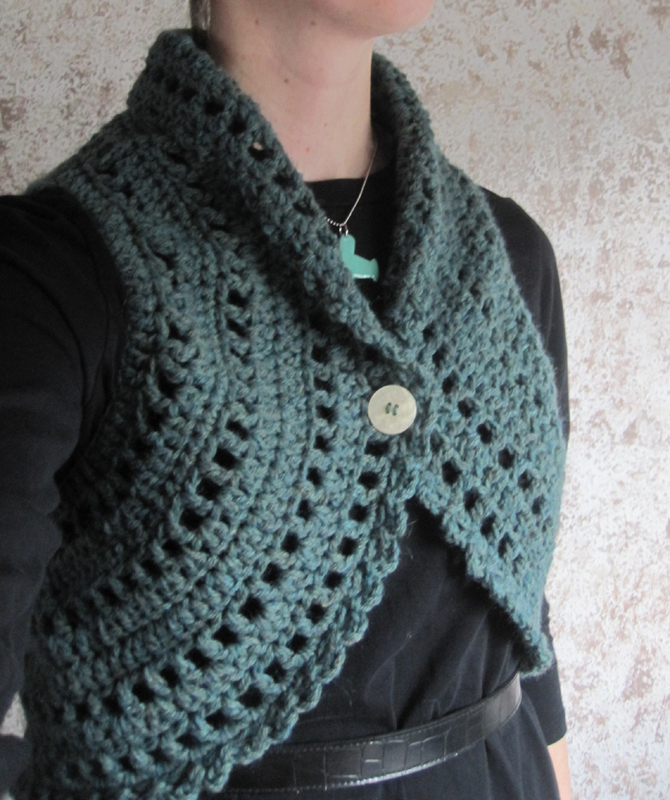 It’s not something I’ll try to sell for the very reason it’s too much like the other pattern and the designer stipulates her pattern is for personal use only, but then I start wondering…well, would it be okay because I did do all the math myself and didn’t use the exact pattern? It’s one of those areas I tend to avoid as much as possible just so the question won’t come up. I’m curious how others handle the whole inspiration/ copying issue? On another investment note, due to circumstances the Dearliest found himself with a bucket of black dirt as part of a collection of things he hauled away for someone. He was preparing to toss it when it crossed his mind that the person he’d gotten it from used to be into gold mining. Long story short, it turned out the black dirt was concentrate. Or maybe ore? I’m a little unclear on my terminology, although it has been explained to me once. 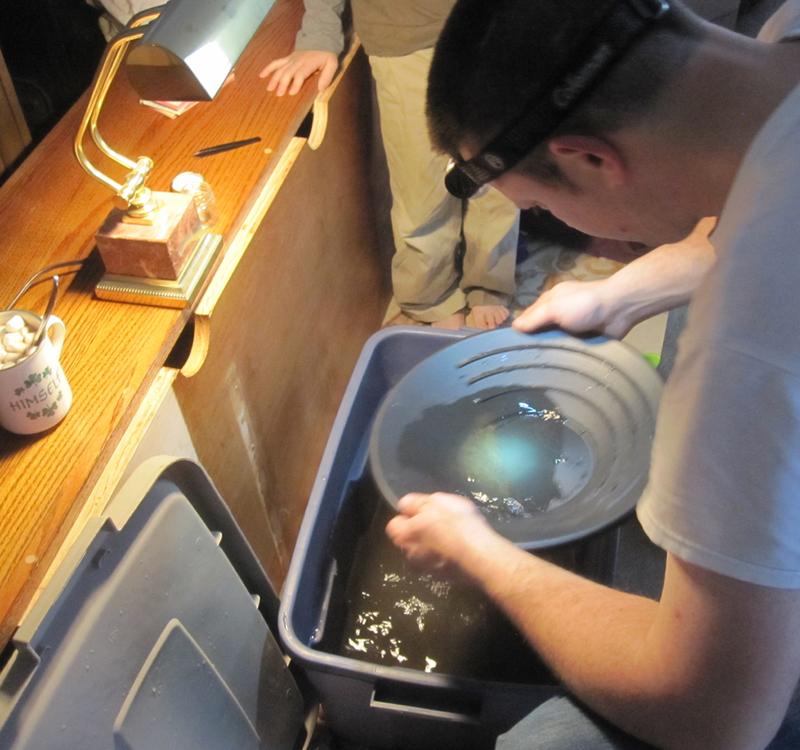 After a few weeks of reading and YouTube videos, gold mining is now a new hobby in the house, and yesterday while the rain poured down the Dearliest set up an improvised mining shop in our living room so the kids could “help.” Or watch. Or get shooed to other activities once a shovelful of dirt ended up tossed gleefully across the carpet. It’ll be interesting to see what (if anything) comes from the venture. For now it’s just fun to do, and the few flecks of gold fines he’s found so far is enough to keep the motivation up! I’m quite excited to be participating in my first ever crochet event! I’m making a few blocks for a collaborative blanket hosted by Patch, who I think is amazing and brave to be taking this on. 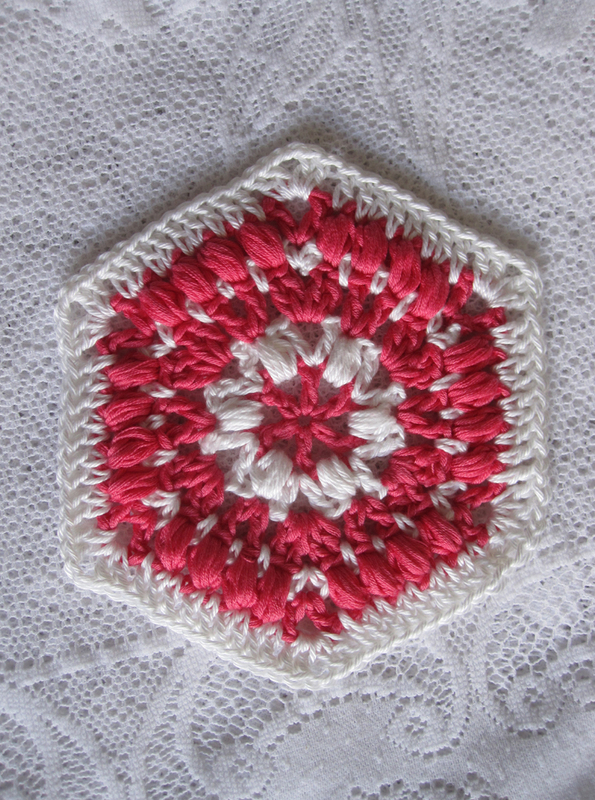 The theme is hexagons, and I’ve been enjoying scouting out patterns. The biggest challenge for me so far has been yarn. 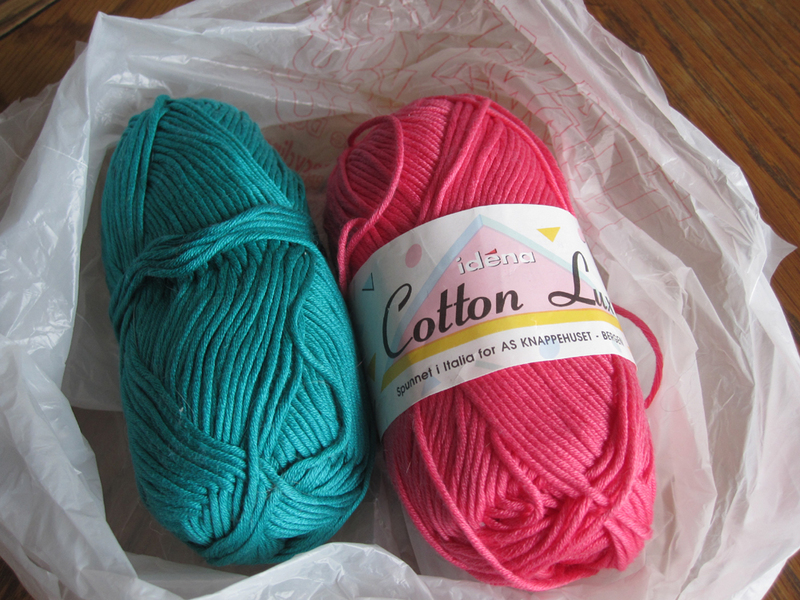 Nobody locally carries 100% cotton DK yarn, and I wanted higher quality so no Sugar N’ Cream for me. I took to eBay and found a gal selling off a stash of Cotton Lux Egyptian Cotton. A lot of it was already gone but there were two colors left. This is by far the nicest cotton yarn I have ever had in my possession, and I’m quite afraid I’ve now been utterly spoiled. 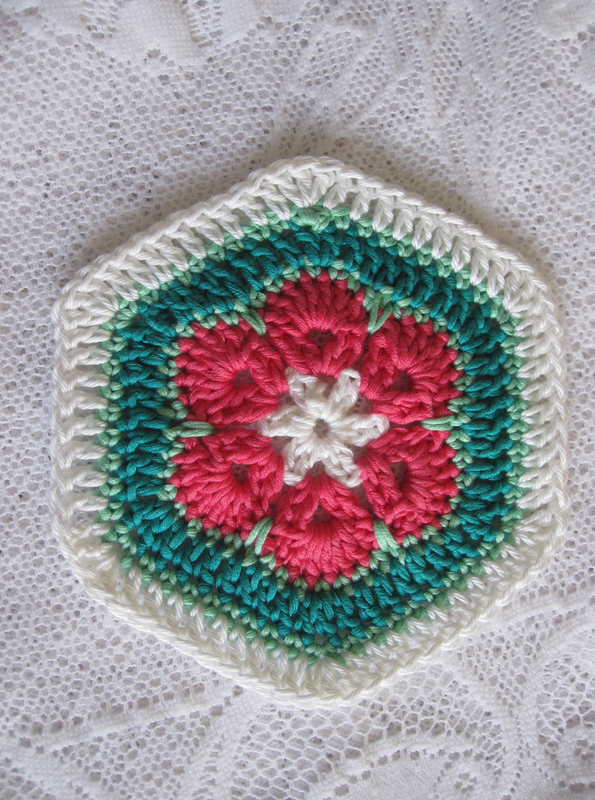 Also, it presented a little dilemma because I still need white and maybe one other color. 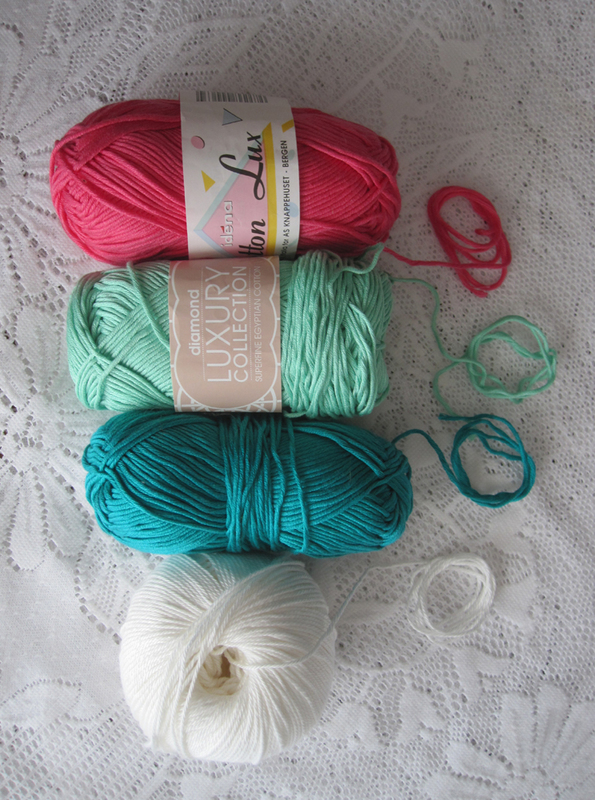 Upon several searches and even contacting the gal I bought the yarn from, it came out that Cotton Lux is discontinued and there’s barely any available anywhere. I finally bought a comparable (I hope) skein of Sublime cotton in white from yarn.com. I’ve never used Sublime yarn before, I’ve never bought from yarn.com either, and while we’re at it I’ve never paid that much for one skein of yarn in my LIFE. New experiences everywhere! Hopefully it all turns out well. For now, however, I’m off to less creative pursuits in the form of scrubbing out my oven.